Disclaimer: The writer is a member, but not associated with the Harvest Hosts organizers. 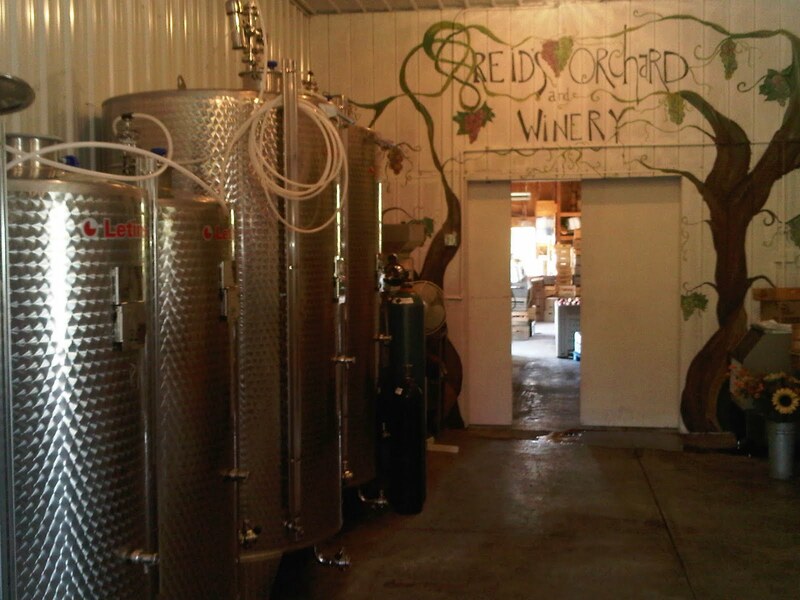 Do you travel by RV (recreational vehicle) and enjoy visiting vineyards? This is the case for us. There have been long trips made bearable with vineyard tour breaks along the way. And there have been trips made specifically to visit vineyards in only one geographical area or state. Over the years we have stayed overnight at vineyards with the permission of the owners. This has been usually because of vineyard events, literally getting lost, or waiting for next day winery opening hours. Now there is a new RV vineyard travel venue provided by Harvest Hosts. Already in Harvest Hosts? 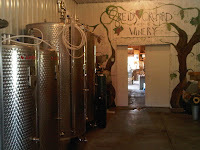 first year of operation, there are over 160 vineyards (with new additions each month) belonging to a winery organization that allows you to stay overnight with them at no cost. Sure, there are wineries sporting full service fee camping with water and electricity in Arkansas, Idaho, Virginia, etc., but with a Harvest Hosts annual membership you get a downloadable listing of select vineyards that will let you stay without hookups FREE. Since most RVs are self-contained units, the possibilities of wine tour travel is unlimited from Florida-to-Maine-to-Washington State-to-California and almost every state in between. FREE does not come without some very easy to live with restrictions and a simple Harvest Hosts membership Code of Conduct which includes: courtesy; calling ahead for confirmation space; arriving during business hours; checking if the host allows pets; staying no longer than 24 hours; take all trash with you; etc. Realize that these selected vineyard sites are not campgrounds, but are hosts that invite you to stay onsite and visit their winery. Required calling ahead secures if an overnight site is available. Most vineyards are limited to 1-to-4 vehicle and not available during special events as reunions, weddings, business receptions, or when they may be seasonally closed. 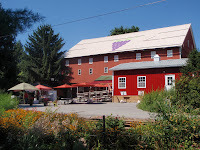 Benefits have included sitting quietly at a closed vineyard by yourself viewing sunsets with wine in hand, meeting some truly interesting vintners after winery hours, sharing with others lovely wines and travel ideas, or eating evening gourmet meals at the vineyard?s restaurant and retiring comfortably to your nearby RV. 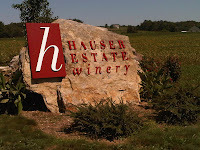 If you can live without RV hookups, a few common sense rules, and enjoy visiting vineyards, let me encourage you to look into Harvest Hosts (http://www.harvesthosts.com/). 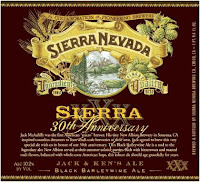 It's hard to believe but the pioneering craft brewer, Sierra Nevada Brewing Company is celebrating it's 30th Anniversary. 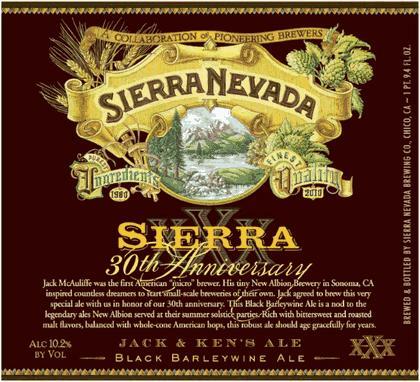 To commemorate this longevity the brewery is offering a few anniversary beers - including the one I purchased: Jack & Ken's Ale. The beer was made in honor of and with participation from Jack McAuliffe, who was the first American "micro" brewer. "His tiny New Albion Brewery in Sonoma, California inspired countless dreamers to start small-scale breweries of their own" - including Ken Grossman and Sierra Nevada. "This Black Barleywine Ale is a nod to the legendary ales New Albion served at their legendary summer solstice parties". This is a barley wine, made strong (over 10% abv), dark and full bodied. It is extremely smooth however, and I finished the bottle after a 15 mile bike rode. Very refreshing for a strong dark beer. The reason - a nice balance of malt and hops. For the first two days of this week, First Lady Maureen McDonnell will conduct a series of wine tours in Northern Virginia as a part of The First Lady’s Initiatives Team Effort. The group will visit Chrysalis Vineyards, Breaux Vineyards, Tarara Vineyards, Pearmund Cellars, Rappahannock Cellars, Philip Carter Winery. No doubt she will be able to sample some excellent Viognier, Cabernet Franc, and Petit Verdot - grape varieties that do very well in the region. 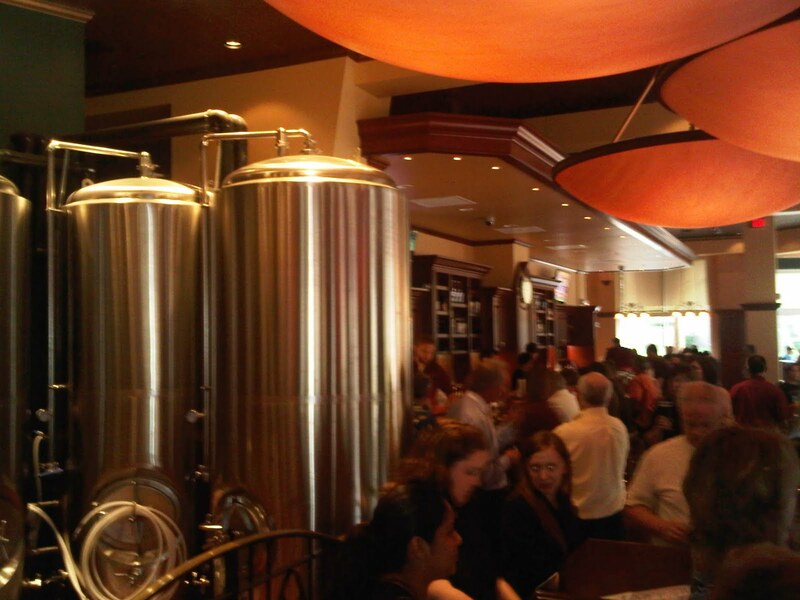 We've always lamented the lack of brewpubs in Northern Virginia. Yes there are a few, but with traffic, they might as well be two states away. 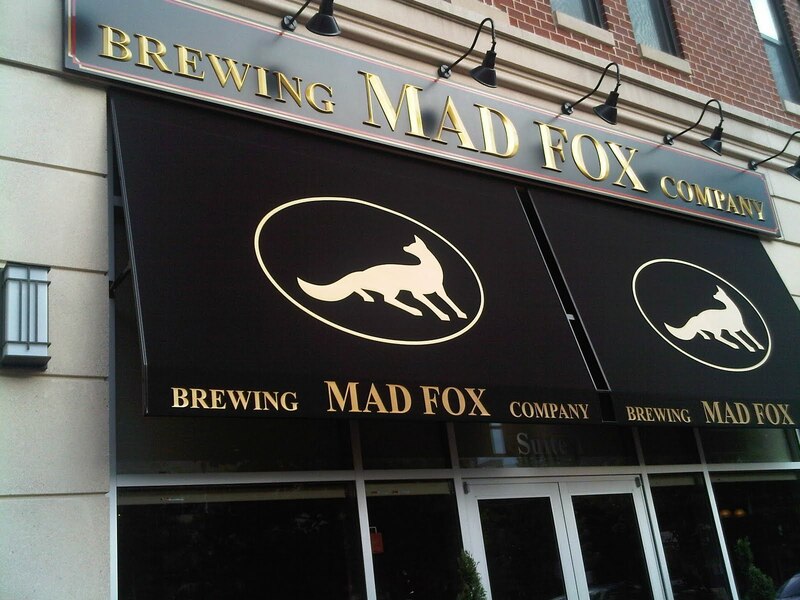 However, that situation was alleviated this July with the opening of Mad Fox Brewing Company in Falls Church. The brewpub\restaurant is owned and operated by Bill Madden and Rick Garvin, the former a well known brewer, the later a Master Beer Judge in the Beer Judge Certification Program. Nice pedigrees. In fact Madden is mostly known for his work at Capitol City Brewing in Washington DC and Vintage 50 in Leesburg, Virginia. Now he has his own place. 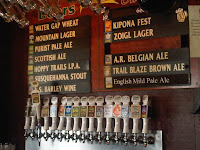 The brewpub is located in the middle of Falls Church on Broad Street and features several German beer styles that Madden has mastered. We arrived this past Saturday to a packed bar - but the brewpub is spacious enough to allow us to grab a seat. There were several families in attendance which was good to note for future outings. Plus the kitchen cooks every meal from scratch - event the cucumbers are pickled in house. However, instead of a food, we stuck to the beers and tried five brews: Altbier, Kolsch, Lindy's Weisse, 80 Shilling, and Wee Heavy. The first and last were our overall favorites - but don't ignore the middle. In order to mimic the flavors from those made in the German Dusseldorf region, Madden uses Munich and Chocolate wheat malts along with Spalt hops to create a perfectly balanced beer. Flavorful and smooth with a slight hop tail. The Kolsch will be our beer of choice when coming off the bike path. It is hoppier than most Cologne versions but the extra hops adds just enough refreshing characteristics to make this more than just a "light" beer. We were glad to see a hefeweisen offered and their Lindy's Weisse is a true Bavarian style Hefe. It is unfiltered, yeasty, and full of wheat flavor that includes an interesting mix of citrus and banana. Next up was the 80 Shilling served from the cask and this was actually a little disappointing. Just no real flavor - and we usually enjoy beers from the cask because the lower carbonation and higher serving temperatures usually enhance the flavor. This beer was soon forgotten when we sipped the Wee Heavy, a Scottish Ale and served in a sifter (8.6% abv). This is a sweet beer - some toffee flavors and is lightly hopped - just a full styled beer. Nicely done. 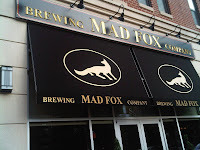 There is no doubt that the Mad Fox Brewing Company will become a regular stop in our beer adventures. Plus living so close and being less than a mile from the Old Dominion bike path makes it all too easy to become a regular. See you there. When Wine-Compass.com first started we published a regular Wine 101 series featuring relatively unknown grapes - primarily of the labrusca variety, but also some hybrids, muscadine, norton, and viniferia grapes. Over time we fell behind posting new articles on the subject and eventually the series fading away. However, this week we discovered a wine writer who has created a similar series - albeit way more robust than anything we published. The writer is Chris Kern and the website, ForgottenGrapes.com. Mr. Kern spends more time on "forgotten" viniferia varieties than our series - which is a good thing - since many of these grapes are popular in other parts of the world. 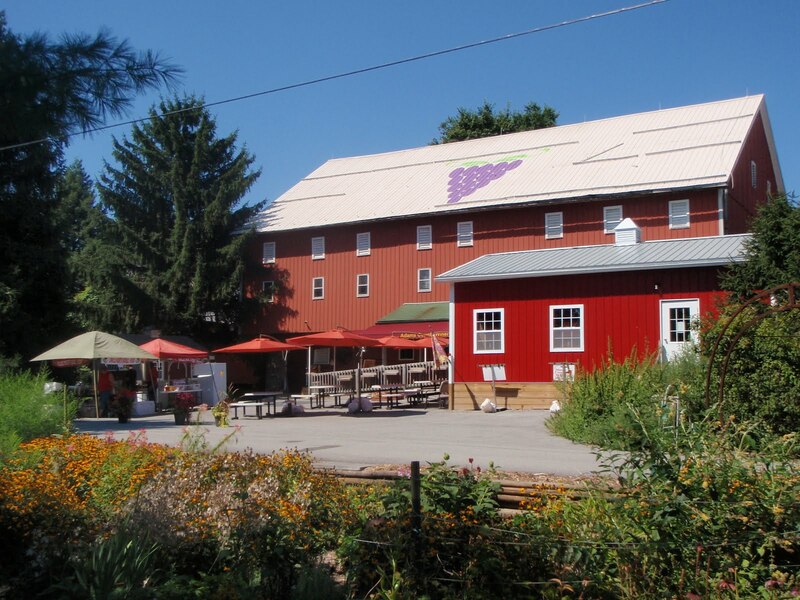 Based out west, Kern has scheduled several “Getting Friendly with Forgotten Grapes” seminars at wineshops along the east coast. Prices vary for each event, but each include generous pours of each of the five Forgotten Grape wines, and a cheese plate paired with the wine. If you are unable to attend one of these events, we most definitely recommend visiting ForgottenGrapes.com to increase your knowledge and appreciation of these grapes. * THOUSANDS of CRABS and other great foods on-hand. * There will be over 50 beers, wines and a few spirits. All of your favorite craft beers and perfectly paired wines will be served to highlight the seafood on-hand. * Enjoy The “Soon To Be World Famous” Chilled Tequila Tasting Bar. Margaritas and Wine-A-Ritas available for additional purchase. * Taste The Great Food. There is Great Crabs and MORE CRABS and MORE CRABS and even MORE CRABS. * Other great food options will be on-site as well for an additional purchase - summer favorites like hot dogs, hamburgers, sausages, pit beef, barbecue and other options. * Live Music on The Main Stage! 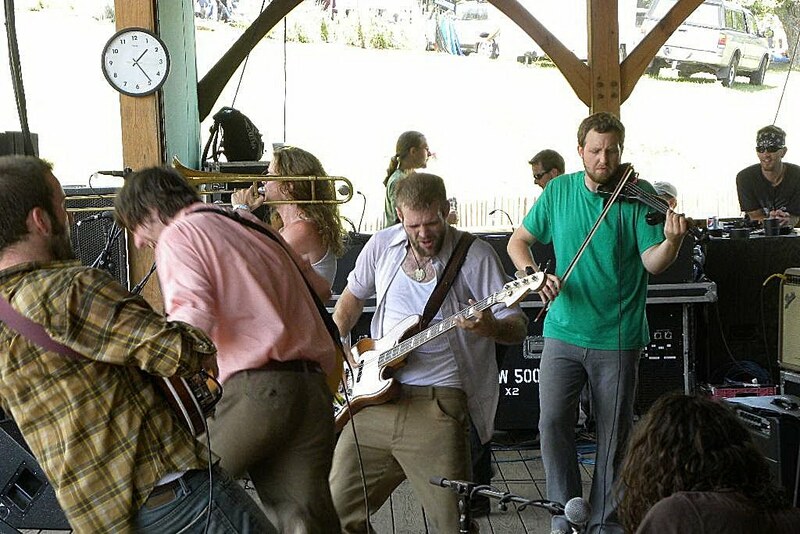 Enjoy the Sounds of local and regional favorite bands as they rock the waterfront. * Special Kids Area and Family Fun Zone. Come and enjoy the moon bounces, activity centers and other great options so that the little ones can come out and enjoy too. * Thousands of Tables and Chairs and Huge Tents for crackin’ to your heart’s content undercover with the beautiful summer breezes from the water. We’ve even ordered enough crab paper to stretch all the way across The Potomac and back. * All the show features are undercover- so Rain or Shine- you should be fine. Tonight we film our second episode of MyJoogTV, where we pair musicians with makers of wine, beer, and spirits. This show will feature Holy Ghost Tent Revival in a discussion of beer and music with Abby Casarella, from Flying Dog Brewery. We plan on discussing touring, beer labels, Frederick, and anything else that comes to mind. We will then follow HGTR to Cafe Nola where they will be performing this evening. The show starts at 9:00 and best of all, it's FREE; come on out to see a great show. 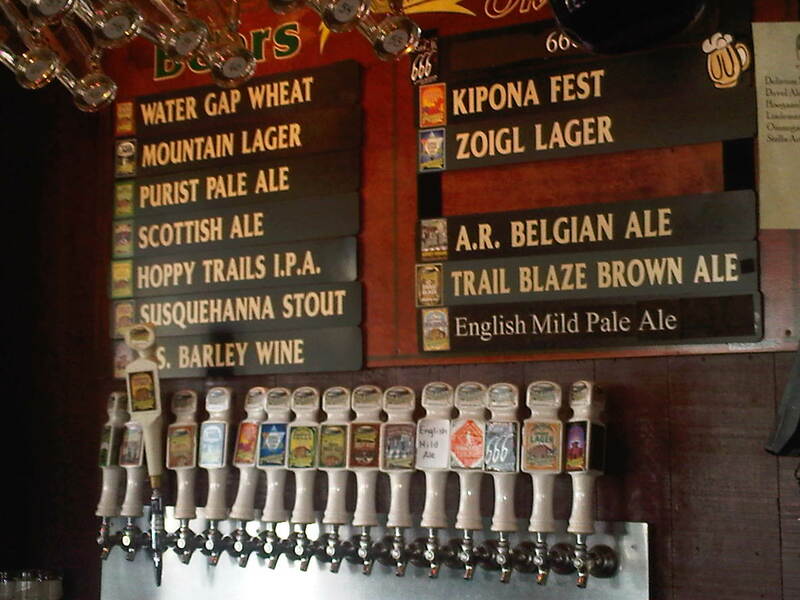 Plus Flying Dog beer is served at the cafe. And the video podcast should be available at the end of the month. As a small country, Hungarian produces an abundant assortment of beer, wine, spirits, and liquors. One that I have always shied away from is the very popular Zwack Unicum - a licorice flavored digestif liquor that was first produced in 1790 during the Habsburg dynasty. However, when Mrs WineCompass returned with a bottle containing the Zwack label, I took a deeper interest into the distillery and found a very adventurous and enduring family history. The bottle in question was the recently released Zwack Maximilian, a brandy made in Kecskemet from late harvest Furmint grapes grown in the Tokaj region. 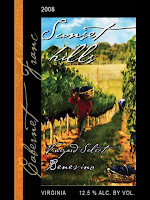 Great grape, great growing region - a nice start. Then the brandy is aged in oak barrels, bottled by hand, and the result is a fine, fine brandy. And it has an interesting story - made from a long lost family recipe first concocted in 1912. "After the war, during which the family lived in a cellar with two unexploded bombs, which they nicknamed Rózsa and Zsuzsa, over their heads, Mitzi's two brothers, János and Béla, completely rebuilt the factory using the most modern technology available at the time.When, in 1948, the firm was finally ready to resume production at pre-war levels, the newly instated Communist government confiscated everything the family possessed with no compensation and "the world as I knew it", to quote Péter Zwack the present heir to the Zwack Company, "came to an end". János fled to the West sitting on his shooting stick under an upturned barrel with the Unicum recipe in his breast pocket, having bribed the Russian drivers to take him across the border. Béla chose to remain in Hungary, and was deported, together with thousands of other "class enemies", to eke out a miserable existence on the Great Hungarian Plain. Péter Zwack took a train to the Yugoslav border and then walked his way to Trieste where, with an overwhelming surge of joy and relief, he saw the British fleet at anchor in the bay. Péter Zwack returned to Europe in 1970. By then Unicum was already being successfully marketed and distributed in Italy, while Péter Zwack's role became that of opening up new markets and reviving old ones. As the winds of change swept over the whole Eastern bloc, Péter started to receive overtures from Hungary inviting him to return and take over the running of this old family factory. In 1987, while Hungary was still a Communist country, he took a gamble and returned home together with his family. Initially he entered into a Joint Venture with the Hungarian State and then in 1991, together with his partner, Emil Underberg, also a family company, he repurchased the entire State-owned conglomerate incorporating thirteen factories and thirteen hundred workers." Today the distillery operates out of Kecskemet, a plant I must visit on our next trip overseas. And as for Unicum, maybe I was sampling the communist version and not the family version. The Zwack Maximilian - may last another week. Our friend Dezel from My Virginia Wine Spot was featured in this CNN clip regarding H.R. 5034. The battle is ongoing, contact your rep today. Last night we filmed our inaugural episode of MyJoogTV, where we pair musicians with makers of wine, beer, and spirits. This show featured bluegrass sensation Cadillac Sky in a discussion of wine and music with Jordan Harris, the winemaker at Tarara Vineyard & Winery. Specifically we discussed the similarities with winemaking and composing music as well as the shared experience of facing critics - consumers, experts, and within the industry. 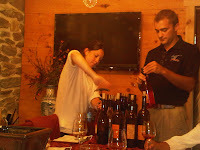 During the discussion we sampled three yet to be bottled wines in Tarara's new "Nova" series. These wines are made from the best grapes grown in specific vineyards or appellations and the futures are actually already sold out. The episode also includes a songs from Cadillac Sky's performance that evening at the winery and should be ready for download in two weeks. Thanks also to Echo Propp, from WAMU Bluegrass Country, for participating as well.